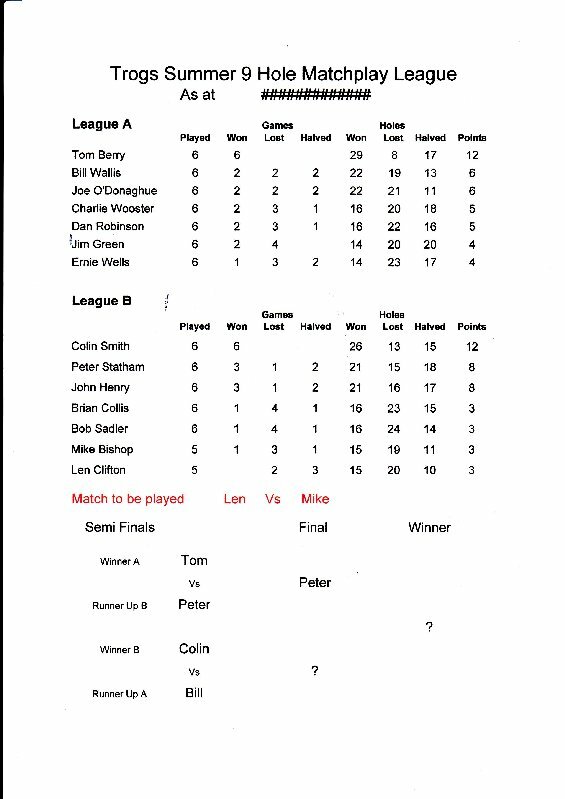 3) These mini league games to be completed by 30th November 2009 and results recorded on list in clubhouse. 4) In event of a tie in the mini league position then the specific result from tying persons will be taken into account to determine placing in Challenge League. 2) After league order is determined by above matches, each person will be eligible to make 1 challenge per week against a player up to 2 places above. 3) ANY format of game can be selected by the person challenged. 4) If challenge is successful player moves above the position of person challenged. 5) A player can be challenged any number of times in any week! 6) Additional players can be accepted into challenge league on payment of £1.00 BUT must start at bottom of league. 1) All results to be recorded on results sheet in clubhouse on day of challenge. 2) New league positions will be calculated in order of above results with a new league position posted each Monday. 3) Monday’s league position will be used all week. 1) As part of the purpose of this league is also to raise money for a charity each challenge made throughout the competition will require a donation of 50p. This competition will also implement the suggested charity raising issue of £0.50 for every ball into fence or driving range on 1st Hole!